Starring: Dave Franco, James Franco, Seth Rogen, Ari Graynor, and more. What kind of a mindset should you have when you enter an auditorium to watch a movie about another movie that is regarded as the greatest worst movie ever? This question was something I battled before and throughout the film. On one end, I am tempering expectations for Oscar-worthiness. On another end… I am watching a film based off of the greatest worst movie ever! Ultimately, watching ‘The Disaster Artist’ resulted in an overall positive experience. It is a one-of-a-kind film that is well worth a watch, while it also puts into perspective what kind of a genius madman Tommy Wiseau is. For ‘The Disaster Artist’, I was most fond of its early acts. The first 30 maybe 45 minutes were easily its best content. Between the Hollywood struggle for Greg and Tommy (played respectively by Dave and James Franco) that was enticing to watch, to the absolute comedy gold that the two brothers deliver. Early on, the film started out sprinting. However, once the story of the production of ‘The Room’ began, that is when I felt it began to lose its entertainment value. With that being said, the film by any means, does not lose my interest as I was still interested on the background of how ‘The Room’ was made and to see it play out while also seeing the Franco brothers work their magic together. Speaking of the Franco brothers, this cast was A+. As a big fan of ‘This Is the End’ and overall most of James Franco and company’s projects, with a cast like this, whether it was a small part or big part, it is full of mindless inappropriate entertainment and I love it. Rogan, Efron, Hutcherson, Graynor, simply just everyone. The supporting cast were just as solid as the Franco brothers themselves. 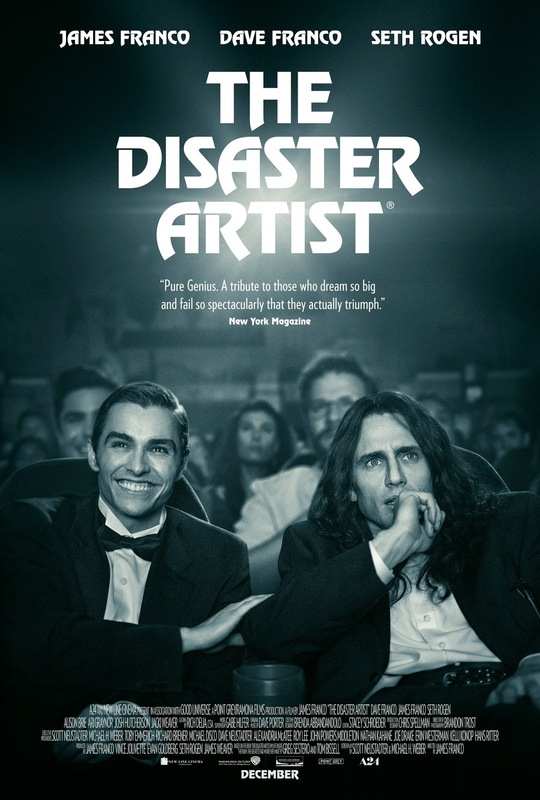 I have seen ‘The Disaster Artist’ be tagged as a “dramedy” and that tag is quite fitting. While the comedy aspect of the film is what truly carried the film on top of impressive performances lead by James Franco as Tommy Wiseau, the drama aspect of the film is what affected my overall reception of the film. With that said, the drama isn’t necessarily bad because it did keep me interested throughout the film, I just felt that it began to run out of steam compared to the early phases of the film. For fans of ‘The Room’, ‘The Disaster Artist’ is a must see. In regards to Oscar nominations and insanely high praise reviews, I think that is overshooting a bit. It is a fun and entertaining film and James Franco is easily the best piece of the film but that is about where it ends. Posted in 2017 Movies, Movie Review, The Oscars.Tagged Dave Franco, Greg Sestero, James Franco, The Disaster Artist, The Room, Tommy Wiseau.